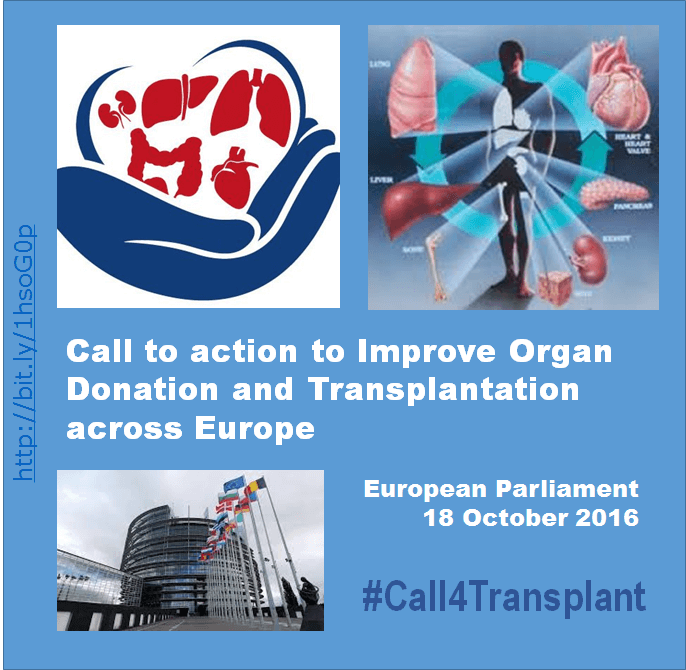 On the 18th of October 2016 a multi-stakeholder cross-condition meeting was held in the European Parliament in Brussels to discuss how to improve organ donation and transplantation across the EU, click here for full report. The EP event had an impressive media coverage, click here for the media report and photos. Endorse the Call to Action! Any other organization with a focus on public health issues, including health authorities, academia, research institutes, medical professional societies. Add a hyperlink which takes you either to a dedicated page on your own website or to the PHA Europe website. Check with your webmaster if the campaign logo can be added to your signature on e-mail correspondance. In general share/retweet/favorite any news on the social media related to organ donation and transplant. Whevever you mention the Call to Action and campaign on your website, in social media posts or other, always make sure you use the hashtag #CALL4Transplant, which has the double meaning of the Call to Action and the actual call for transplant which patients receive when the time for surgery has arrived. Take a picture with the pledge and share it on your organizations’s social media channels. 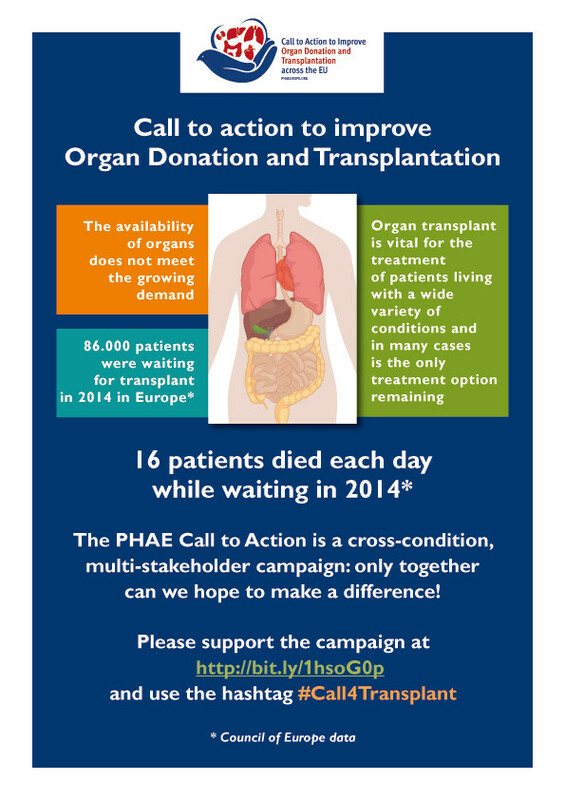 Send the photo to us at p.ferrari@phaeurope.org so we can also disseminate it. When you are holding one of your organisations events, you might consider speaking about the campaign. At a conference you might wish to add a slide or two about the campaign to your presentation or poster (see appendix with campaign materials). Depending on your possibilities/time/workload you may consider the possibility of organising an event to celebrate EODD. Regardless of how big or small your event, the important thing is to raise awareness of organ donation and transplantation. Take plenty of photos and, if possible, video footage. This creates a lasting memory of your event and can be used on social media, sent to journalists and included in your organization journal. This can be done in conjunction with an event (see above). 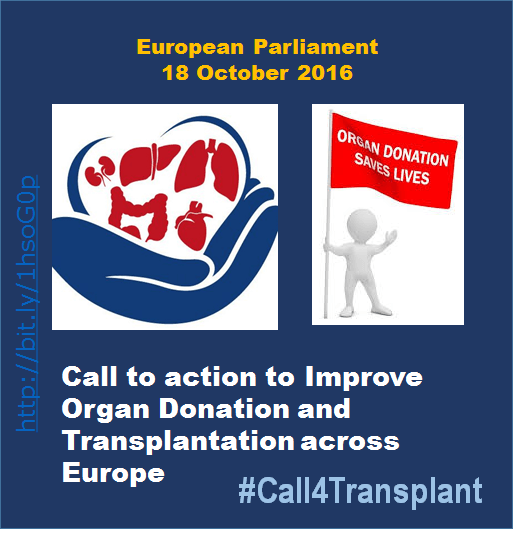 Or else, you can take advantage of the momentum that will be generated by the European Organ Donation Day on October 10 to send out a press release or just contact a few journalists to speak of the Call to Action and campaign. See template press release below. Inform us about what you are doing so that we can share this news! Keep us informed of anything that is happening in your organization or country so that we can in turn share the news, tweet, retweet or favorite it on the PHAE website and social media channels. The Call to Action can be translated into other languages so that your affiliates and national organization can use it for advocacy or awareness activities locally. We will provide translations, please write to p.ferrari@phaeurope.org. The campaign logo can be used for T shirts, hats, pens, canvas bags and other merchandising items to use at events or for any other awareness raising activities.